Armada Music recently announced some new events to be held this summer in Ibiza. 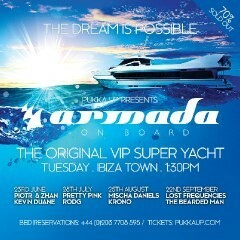 Part of the Armada Nights, a unique vessel will harbour a brand new concept with a line-up of Armada artists. This summer, fans will board the Original VIP Yacht alongside various Armada artists, including Krono, Lost Frequencies, Piotr & Zhan, Pretty Pink, Rodg and The Bearded Man. Taken on a VIP boat trip from Ibiza Town via Es Vedra to Formentera and back, attendees of the daytime event can enjoy a blend of deep house music. Furthermore, ticket buyers will be treated to VIP balcony access that evening at Amnesia club, and are free to access the Ocean Beach Club the next day. Armada On Board is spread over four events over four months, with a different set of Armada artists behind the decks each time.